Ophelia LaCroix, the name that strikes fear and respect into the hearts of Gremlins everywhere. 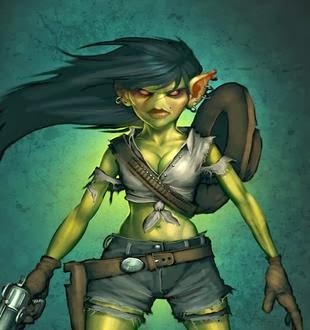 That she has become the leader of the most powerful Kin in Malifaux as a girl is even more amazing. It would be like if Marilyn Monroe took Joan of Arc’s place at the head of the French armies. Let’s take a closer look at this amazing Gremlin. Ophelia has very good stats not just for Gremlins, but also for any model. Defense and Willpower of six, twelve wounds, 6-inch walk and charge and Ht 1. This makes Ophelia a very solid model. She has Companion allowing her to activate after a friendly model within 6-inches has finished so her Young can shoot one of her guns and then reload it back to Ophelia, allowing her to take a shot with it. On a Mask, she has “Second Loudest Squeel!” she can push 4-inches after suffering damage in any direction. That she has the trigger on her Wp, as well as her Df, is great since it allows her to escape engagement even from models that target Wp instead of defense. Shoot High Boys allows friendly models within 3-inches of Ophelia to ignore randomization into engagement for Ht 1 models (unless the original target was Ht 1). An undervalued ability on Ophelia is Plink! Before making any damage prevention flips Ophelia can discard an upgrade to reduce the damage by 1. This can allow Ophelia to prevent, at minimum, 2 damage by spending a Soul Stone and discarding an upgrade. When standing in Lenny’s damage reduction aura, the minimum increases to 3 with the obvious exception of a Black Joker showing up on the prevention flip. Since Ophelia and her Young can always give upgrades back, she can afford to discard her named upgrades in an effort to stay alive. Ophelia has one attack action and it is one of the most dangerous. 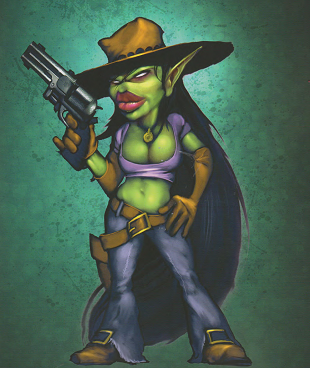 Her Rough Rider pistols (why only carry one when you can use two) are one of the most accurate and damaging attacks in the game. As Sh 6 with a positive to hit, she can generally hit anything she wants rather reliably. On a Ram, she can up her damage profile to 4/6/8 from 2/3/4. This damage track is on par with Seamus’ .50 Cal but unlike Seamus, Ophelia, being smarter, used two pistols that were not black powder based so she can use her pistols more than once per turn. Silly Seamus! Onto her tactical actions, she has three of them. Two of them are listed erroneously under attack actions so we’ll cover those two actions first. With My Eye Closed, a (0) action, lets Ophelia turn into a little green Annie Oakley. This Action imparts all of Ophelia’s attacks with a single positive to hit, but your opponent gets to choose the target. The target must be a legal enemy model in range and line of sight. This allows Ophelia to use her gun upgrades the same as her Rough Riders getting a positive twists to attack. If she uses her Rough Riders, she gets a double positive twist to hit. This is a great action but takes proper positioning to be able to kill a single model, it also competes with Ophelia’s other (0) action, Ooh A Girl. This other (0) action on Ophelia allows her to target a friendly Gremlin with 8-inches and push them into base contact with herself. This can be great for moving around Rami and Lenny, and it is one of the integral steps to launching a Pere bomb at the opponent. Keep in mind that this is a push so impassable terrain will stop the pushed model from making all the way to Ophelia. It is also a great way to move Gremlins out of engagement range of the big hitters in an enemy crew. Her last tactical action is a (1) Action to Reload one of her named upgrades, pretty straight forward since every time she uses an attack action on her upgrade it gets discarded. So this allows you to get that gun back and fire it again, whether with Ophelia or a Young LaCroix, which seem to hang about her. This action is integral to her Plink! ability allowing her to get back upgrades to reduce damage. This gun gives Ophelia a 12-inch gun that ignores line of sight with a 3/4/5 damage profile. It also gives Ophelia another (0) action, Your Turn, that lets her target another friendly Kin model within 2-inches of her and place that model anywhere within 8-inches of her. Any model placed this way can’t take interact actions for the rest of the turn but it is a good way to get Rami into a sniper’s nest ignoring terrain and terrain elevation, or really starting out the Pere Slingshot like a boss. This gun gives Ophelia a 10-inch blast based attack that will only do a maximum of one damage. The key is to maximize the blasts with moderate and severe damage since everyone damaged by the attack will gain Burning +2. This attack does ignore cover, so a focus here gives positives to attack and damage, allowing you to do a maximum of 1 damage and Burning +2 with three blasts on a severe. It also endows Ophelia with a new (1) action of Move and Burn. This lets friendly Kin within a pulse of 10-inches with the Paralyzed or Slow condition to catch on fire for Burning +1 and lose Paralyzed and Slow conditions. Trading 1 damage at the end of the turn to allow Kin models to lose Paralyzed and Slow can be helpful in a crew facing any models that can cause the Paralyzed condition (looking at you Pandora!) since as we have seen most of them have horrid Wp stats. This attack deals 3/5/6 damage at 10-inches and forces the target pass a TN 13 Horror duel after suffering damage from it. On a Ram you get the trigger of not only the original target, but also everyone within a pulse of 3-inches must take a TN 13 Horror duel. Yeah, didn’t think Gremlins could Paralyze did ya? This upgrade also give Ophelia yet another (0) action of Move it! This action allows Ophelia to target a friendly Kin and force them to take a (1) action, albeit with a negative to any duels during this action. So Ophelia can force a Kin to walk forward, or interact with this instead of attacking because the probabilities of getting in a successful attack are rather slim. One thing this does work well with is using it on Francois. Francois can mitigate the negative be spending a Soul Stone to get a positive to the duel allowing him to act and cheat as normal. Overall Ophelia is a master that, though straight forward, has a ton of complexity built into her. Her named upgrades aren’t just great for the attack actions but prove to make some interesting combinations with the tactical actions they bring to Ophelia. With cycling upgrades she becomes a Master that can adapt to most situations on the fly as well as being hard to take down if you remember to use her Plink ability. She is susceptible to Devour from any model that has it because she is Ht 1 though the use of the Stilts general upgrade can mitigate the danger. This can make for a tough choice when facing crews that can bring any Devour based models. She is about as brutal as a ranged Master can get with one of the best damage profiles in the game. She doesn’t have the extreme range of Perdita or Rasputina, but she can often position herself, as well as her crew, for points almost every turn. The moon shinobis are not kin, so it does not work at all.